The FDA has approved the first drug for a serious condition that can affect women during pregnancy or shortly after giving birth. We’re talking about postpartum depression. (WXYZ) — The FDA has approved the first drug for a serious condition that can affect women during pregnancy or shortly after giving birth. We’re talking about postpartum depression. Question: Can you tell us about this drug and how quickly it works? The newly-approved drug is brexanolone. Its main ingredient is allopregnanolone, a synthetic form of a hormone that is produced by progesterone in the brain. It affects the GABA neurotransmitters which help regulate your mood. Now research has shown brexanolone is very effective. Especially when you compare it to current treatments like counseling and antidepressants. These can take weeks to take effect and for some women, they don’t help much at all. But brexanolone has been reported to work within 48 hours. Question: How is the medication prescribed and are there any side-effects? The treatment will only be available at certified medical centers through a restricted program called the Zulresso REMS Program. And there are a couple of reasons for this. Number one, the drug will be administered through an intravenous drip for 60 continuous hours. Yes, that means two and a half days. And number two, the side effects can be serious. Sudden loss of consciousness and excessive sedation can happen. So women will need to be monitored for safety reasons. 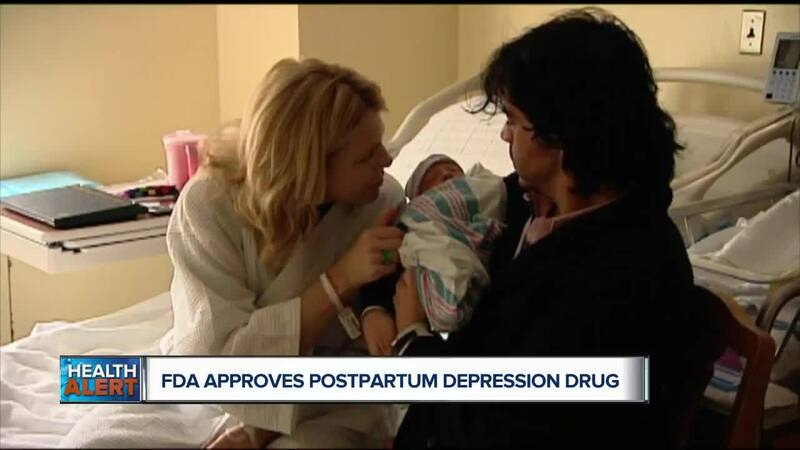 Question: How effective is this treatment and will it help all women with postpartum depression? In clinical studies, patients with moderate and severe postpartum took part. Overall, roughly 75% who received brexanolone were reported to have at least a 50% improvement when compared to women who were only given a placebo. And about half were considered to be no longer clinically depressed. So this sounds very positive. Now you might be thinking, how do I know if I have postpartum depression. Well, the feelings are similar to the baby blue’s but they run much deeper and last longer. Symptoms include extreme sadness, anxiety, crying excessively, feeling hopeless, worthless, empty or alone. You may have trouble taking care of yourself or the new baby. You may also have thoughts of death or suicide. If you feel experience any of these symptoms, please reach out to your OBGYN or family doctor who can help.